Quarton Laser Module VLM-635-03 LPA (ECONOMICAL DOT LASER) by Infiniter at Pacs BG. MPN: VLM-635-03 LPA. Hurry! Limited time offer. Offer valid only while supplies last. APPLICATIONS: Red Dot spot - for positioning, measuring, pointing and laser sighting device. Wood processing. Metal processing. Stone processing. APPLICATIONS: Red Dot spot - for positioning, measuring, pointing and laser sighting device. Wood processing. Metal processing. Stone processing. Textile industry. Food industry. Automotive industry. Medical science. Wave length: 635nm. Output power: Class IIIa - less than 5mW. 2.6~5 VDC operation. Dimensions: D7 x 21 mm. Red laser. Ideal laser module if cost is a very important consideration. This module has an integrated optic, laser diode and APC driver circuit. APC driver circuit enables constant Laser output power. Aspherical plastic lens provides Dot spot. 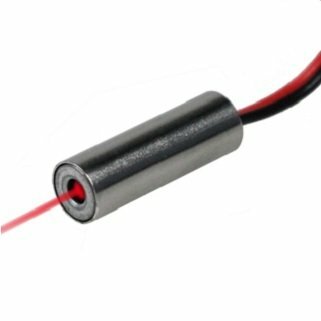 Laser Module is not laser pen, but a module inside the laser pen. If you have any questions about this product by Infiniter, contact us by completing and submitting the form below. If you are looking for a specif part number, please include it with your message.